Matthew Amey's "End of Innocence" series reflects his personal meditations on the transition to adulthood. He explores the implications of these reflective thoughts and feelings with a depiction of the nostalgic sentiment of freedom coupled with stark, gestural strokes and symbolic details. In the enthralling design, a girl is suspended mid-swing while a flock of birds circles the tree's branches. 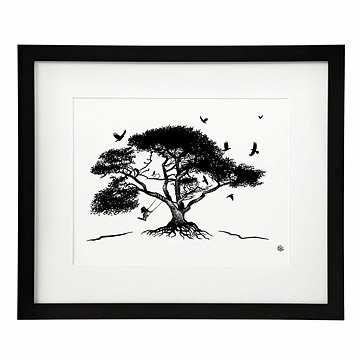 The tree represents stability, safety, comfort, excitement, and the all-encompassing love of family, while the birds represent the opportunities and challenges the child will encounter as she reaches life's crossroads. Available framed,ready to hang with wire hanger, in Eco Care black 16x20 Frame, Mat, and Plexi or unframed mounted and matted on white, FSC certified mat Artique Mat board. I bought both Free and Elation for my grandchildren. These prints so reminded me of their youth and the hours they spent with me, many of them on tree swings we built together. I hope it will always remind them of the joy and love we shared. I plan on hanging it in my office so when I need some inspiration I can be reminded of the sensation of swinging and how it made me feel. This image is stunning. I bought one for my friend and loved it so much that I bought one for myself. Liked Elation so much came back to order Free & Whispers. Sizing in framed collection differs by print. This print met and exceeded my expectations. Well framed. It is unique and I love the subject, it makes me happy every time I see it. Waited too long to buy "jump off", as it was sold out when I finially decided to order. But I like this one nearly as well. Great inspiration for anyone in the process of undergoing a life change! I purchased this framed print to hang in the Children's Room in my home; that is, the room where my two small granddaughters regularly play and sleep when they come to visit. I wanted the one in the series where the little girl jumps OFF the swing, but it was sold out :( so I bought this one, where the girl is still swinging. I see it as sort of a poem, and I hope it comes to symbolize the happy, simple times my granddaughters are having at my house, and will, in turn, help to create pleasant childhood memories for them. I love the feeling this print invokes. I plan to will the print to my granddaughter with a letter to tell her how much the time we spent together meant to me. I hope she will find a perfect place for it in her home someday, just as I have in mine.